Wow. When I was asked to do this by the lovely people at S&S I thought, wow... what an easy subject. Cannot wait! It was only upon sitting down to write this that I realised that it was not easy. Far from it. It has to have been one of the hardest pieces I've done for the blog, be it part of a Blog Tour or not. Really hard. So thanks to S&S and Justin for giving me the challenge! 10) Stukely - Now, not initally one of my favourite characters I couldn't stand him towards the start of the series. Crewmate to Connor turned Vampirate, he always annoyed me when he popped up and being Sidorio's sidekick he just kept coming. But as the series has progressed I've come to really enjoy him as a character. He still has some good in his dried Vampirate husk of a body, and it's buried so deep that all he can seem to do is highlight his flaws. 9) Bo Yin - The innocent, odd, daugher of a swordsmith, she's been a favourite since she first appeard in Blood Captain. Her innocence always makes me smile and is sometimes a good rememdy to the darkness going on in the rest of the books. 8) Mollucco Wraithe - Captain of The Diablo, and a mighty fine pirate. He sure does have his moments of annoyance but he just seems to be one of those characters. Wheter you agree with him, or what he does, or not, you cannot help but like him. 7) Kally - A fishtail (mermaid) who appears in Dead Deep, the novella Justin wrote for World Book Day and then again throughout the subsequent books. She doesn't really have any series-changing moments, but she's a fun little addition and always brightens things up whenever she pops up for air. 6) Darcy Flotsam - Figurehead of the mysterious Nocturn by day, regular Vampirate by night, she's been a consistent source of wisdom for Grace. Other characters waver in their wisdom, The Captain, Lorcan, because they always seem to have other interests at heart, and as we learn throughout the series, secrets to keep, but Darcy always has this sense of honesty about her which I really like and draws me to her as a character. The only downside is that the poor girl is only looking for true love and it seems so far away for her. 5) Lady Lola - One of the most wicked characters in the series, possibly even more than the big bad himself, Sidorio. She ia a complete puppet master. Pulling the strings to get what she wants, when she wants. With a chilling tendancy to bottle the blood of her victims and savour it rather like wine, she'sa highlight on the oceans! 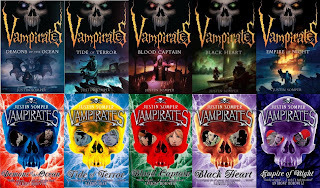 4) The Vampirate Captain - A complete enigma throughout the series, this guy creeped me out majorly in the first few books, and also in the latter, but more so in the early days of the series. The whole mask situation and how his voice never exceeds a whisper even when angry. Creepy creepy dude! 3) Lorcan Furey - An important character all the way throughout the series, and a constant love interest for Grace, Lorcan is the loveable Irish vamp frozen forever in his nineteen year old body. Plucking Grace from the ocean in the first book, Demons of the Ocean, it was clear from the start that he'd be one to watch! 2) Grace and Connor Tempest - Our main characters. Yes, they are technically two different characters, but as they're twins, I'm grouping them togther. They've had a tumultuous journey throughout the series, being shipwrecked and finding themselves on two completely different ships, fighting for their lives in a world of piracy and vampires, no real Top 10 could exist without them. And so it comes down to this, the Number 1 spot. 1) Sidorio - Yes, I know, I hear you. WHAT?! WHAT????!!! Are you mad? You name Sidorio the number 1 Vamps character of all time?! Well guess, what, yes I do? Love him or hate him he is one cracking character! With his golden insisors which puncture his victims bodies to feast on their blood, and his Roman-esque wardrobe and ways, he truly is the self-styled King of the Vampirates. You cannot fault his enthusiasm, no matter how many knockbacks he takes, he won't stop until he gets what he wants. He is definitely a favourite character of mine, no matter how much I try I like him just as much as I am repulsed by him. He, more than any other character in the series has caused greater effect on me, and so therefore he is my Number 1 Vampirates Character! So what do you think? 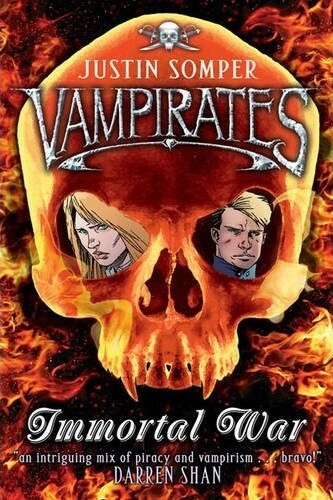 Who are your favourite Vampirates characters?! Leave your comments below! Thanks to Justin and S&S for allowing me to do this. It's been a lot of fun! Be sure to check out the series if you haven't already done so, and if you have, do not miss out on Immortal War! (Review here).